Green, the colour of new life, inspires a refreshing pure wax candle, scented with lemongrass and citrus pure essential oils. Our Green Harmony mood candle is inspired by the new life of spring. Colour Therapy draws on the different influences and meanings associated with colour. The soft green glass jar promotes balance and harmony, and can inspire new ideas. Citrus essential oils are known to have many health benefits. Orange is naturally relaxing and rejuvenating, helping to alleviate anxiety, anger and depression. Lemon oil is also known for its calming properties, reliving fatigue and mental exhaustion, while lime oil is an antioxidant, removing toxins and negative energies from the body. With the natural scent of citrus, create a calming space to ease stress and tension. Meadowsweet has history in folklore, and was one of the sacred herbs of the Druids. It has a sweet, almond-like aroma and was used as pain relief in the past. Bring a little magical healing into your home with this candle. Lemongrass essential oil has many beneficial properties, including antidepressant, antimicrobial, deodorant, insecticidal, sedative and fungicidal. The distinctive sweet, tangy scent will energise and cleanse your home for a fresh spring aroma. 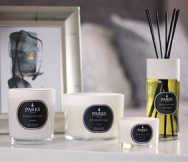 Through this Green three wick candle, citrus and lemongrass essential oils work in harmony to create a crisp, light scent and a naturally refreshing and relaxing environment. Burn your Green candle when in search of inspiration, to bring about change, to rebalance your life, and to bring release when you are feeling restricted or trapped.